This document shows how to restore a file that was overwritten on a LAN drive. To restore a file you have overwritten, see Restore an Overwritten LAN Drive File. Double-click the H drive to open it. In your H: drive, find the folder in which the file(s) you want to restore are/were. Right-click on the folder and choose Properties. To see what would be in the folder, click View. To Copy the older version of the folder to another spot, click Copy and select a folder to copy to. 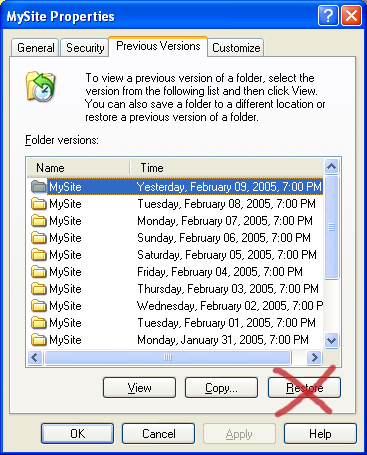 The folder being restored will be copied as a subfolder to the destination you select. To restore to the older version, click Restore. Click Yes to accept the restoration, and OK on the window that says the restoration is completed.